Jazz up a normal Friday afternoon with a thrilling Halloween affair. It’s a great way to boost employee moral. Invite your clients and give them something to be excited about. Use as it as another opportunity to feed them your elevator pitch. While you are at it increase Earth Awareness and make it an Eco-Green event! Here are some Earth Friendly Halloween promotions. Create an enchanting mood with eco-friendly Votive Soy Candles. 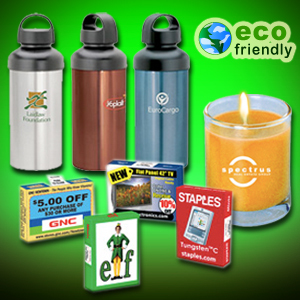 Imprint your company name on the votive and send them home with your guest. What’s a Halloween party with out some treats? The Admints Box Candy is a sweet and affordable treat. The candy boxes are eco-safe biodegradable and reclosable. These premium 20 oz Lucca Aluminum Water Bottles are the perfect prize for anyone who shows up in a costume. These water bottles put your name on a product that will be reused time and again. Rudee October 07, 2009 Comments Off on Going Green This Halloween!